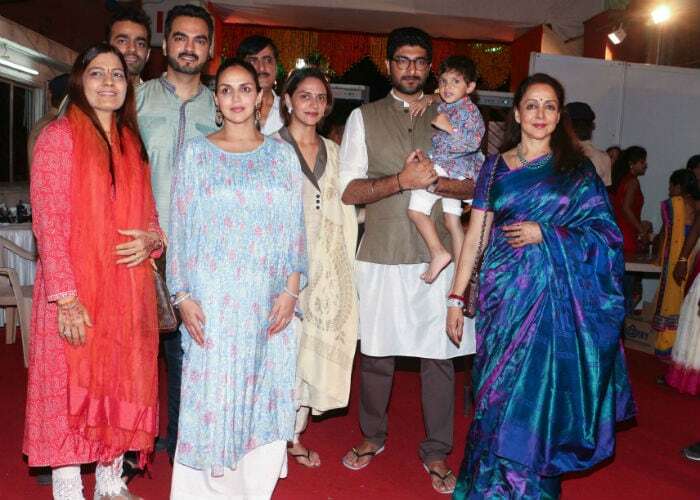 Actress Esha Deol, who is pregnant with her first child, is all set to re-marry husband Bharat Takhtani on August 24, reports Pune Mirror. The rituals form the part of her baby shower. Esha married Bharat, a businessman, on June 29, 2012. She is the elder daughter of star couple Hema Malini and Dharmendra and is married to a Sindhi family. Pune Mirror reports that Esha and Bharat will be taking three pheras instead of seven. A mehndi ceremony will also be held and only family members and close friends are invited. A special chappan bhog for Lord Krishna has been organised followed by a lunch for the guests. "This time it's a Sindhi priest who speaks Hindi too, so my in-laws will at least understand what is being said," Esha told Pune Mirror. For the baby shower, Esha and Bharat's outfits will be designed by Neeta Lulla. She will be wearing a Vrindavan-inspired asymmetrical Anarkali with multi layers of red and pink. "Esha's outfit will be crafted with gota, zardosi and sequin embroidery paired perfectly with a sharara with multi gores which would enable her to walk around freely and make her feel comfortable. Esha particularly wanted a hint of the Radharani colours from the medieval Vrindavan, hence the colour pink to express the power of love and compassion," Neeta Lulla earlier told news agency IANS. Of being married to Bharat, Esha told Pune Mirror, "Over the last five years, Bharat and I have become as thick as thieves. Since I'm pregnant, I'm prone to mood swings now but he's tolerated them and is extremely protective. He's also my best critic, encouraging me in everything I do. At the risk of sounding filmi, I'll say I wouldn't want to change anything, life's beautiful." Last week, Esha along with Bharat, Hema Malini and sister Ahana was spotted at Mumbai's Isckon temple for Janmashtami celebrations. Ahana is married to Daniel Vohra and the couple together have a son. Esha Deol made her debut in Bollywood with 2002's Koi Mere Dil Se Poochhe. She was last seen on screen as one of the judges on the reality show Roadies. She is best-known for her roles in films such as Dhoom, Yuva and Dus.